How to sew a classic or roman shades with his hands? Home / Needlework / How to sew curtains on their own? How to sew the curtains yourself? Nowadays, everything is sold in stores, andsimply stunning selection of products. Although it is difficult to pick up the curtains, they can look beautiful and elegant, but it is not suited to your interior. Or you can find the perfect shower curtain, butthe cost would be exorbitant. What to do in this case? Perhaps the best way out situation would be the purchase of a suitable fabric and sewing of curtains handedly. How to sew a classic curtains? Sew Curtains are not very difficult, especially classical. Even with only basic skills in the art of sewing, you can create a true masterpiece. The first thing to do is to determine,qs tissue. It should be borne in mind that to the added width of about 10 cm at the seams, and a length of 6 cm and 10 cm strip at the bottom hem. The resulting need to measure the height of the side edges on the fabric and make an incision. Then pull the thread and the resultingdotted line to cut off the excess fabric. Begin sewing the curtains with his hands to be with side seams. The width of the hem seams can be from 1 to 3 cm. It is necessary to tuck the side edge, press it it, then once again tuck, stab pins. Stitched sides. Next, you need to hem the bottom shutter with your hands. To this end, tuck the 5 cm fabric, press it, tuck again by 5 cm stab pins, scribbling on a typewriter. The curtain is almost ready, it remains to deal with the horse. We must put the curtain faceupstairs. Side curtain cut the ribbon should bend approximately 2 cm inside. Next, put the belt loops up at the front of the curtain, to combine the upper section of the fabric and tape. Pinned the ribbon pins to the tissue in a checkerboard pattern. Trim the strip about 2 cm and bend inwards so that the edges of the fabric and curtain tapes coincide. Important: need to change the thread on the machine, the shuttle and the upper thread should be white. Now we have to tape stitched on the inner edge indented 1 mm. Further, it should be to get the pin and bend Curtain tape to the wrong side of the fabric. Thus, the line, do just that,will be on. Again, pin the ribbon to pin fabric to change the shuttle on the string, which is stitched by the side seams and bottom, sew the ribbon across the bottom indented 1 mm. Then you must stitched to the side edges of the tapecurtain, pulling out in advance of her shoelaces. It remains to make a line in the middle of the tape, taking care not to scribbling laces and eyelets. At the end it is necessary to remove the pin and tie the laces with each other on each side of the tape. Now you can poutyuzhit curtain and pulling the strings, to give it the desired width. All curtain officially ready to take its place in the house. Learning to sew curtains classic, you can proceed to more complex options with all kinds of fabrics. How to sew roman blinds? 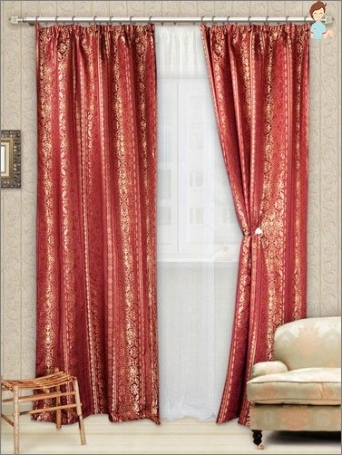 Roman curtain is designed to protect the room from sunlight, it closes a window or hanging to the floor as usual. Roman curtain can be lowered and raised with the help of a special mechanism. Its charm lies in the fact that it looks great and protects the room from excessive light and sewed pretty simple, in addition to tailoring need quite a bit of fabric. Roman blinds should fit on the nose to the window, so you need to iron the fabric before the measurements. Before you begin to sew roman shades with his hands, you must decide how it will be fixed. There are two ways of fastening: inside and outside of the window opening. Inside Roman blinds are fixed when the window sills or larger when it complements the drapes. On the outside of the window it is attached whenwindow opens along the entire length, it has a flap for ventilation. 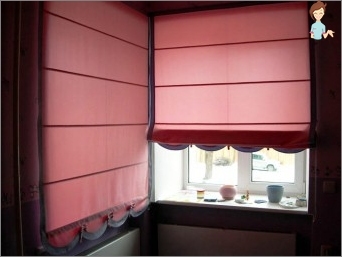 In this case, the curtain should cover the window opening and completely cover the slopes of 5-10 cm. 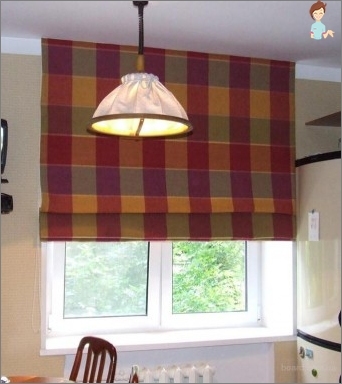 Sew a simple roman blinds can be their own hands. Before the start of sewing works to be measuredadd window opening and 5 cm in width and 12-15 cm in length. This will be the size of the tissue. Depending on the height of the window, it is necessary to determine the number of folds in the table. Further, it should be noted tuck line on the underside of the pleats and space for rings. The rings should be placed equidistant from each other in three rows. Roman blinds sewing processing begins with tissue edges. 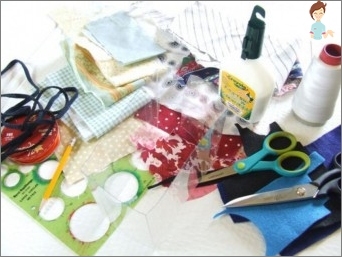 Then it is necessary to treat the upper cut and sew Velcro to it. Bottom should be made podvorot and sew pocket for weighting bar. Along the lines of wrinkles from the inside hem finishing rim and insert pockets rail. Then sew on the marking ring. Sheer curtains ready. Now you must make the window mount. To the underside of the bar should be nailed studs or Velcro furniture stapler. Then, by means of nails attach the rings to the beam. Next, attach the curtain to the beam by means of Velcro. Lace is threaded through the rings should start from the bottom, on the first ring should tie a knot and secure it with glue for strength. Threading the cord through all the rings, it is necessary to withdrawit on one side, the same is done with the rest of laces and bring their ends on the same side. Tightly pull cords to form folds, and now you need to fix the curtain ribbons. Next, you should attach a wooden beam to the frame. Remove the ribbon and lower the shutter. Align the tension of the laces, and keeping them together to engage so that the unit turned immediately after the last ring. Pass the ends through the handle to lift the curtain,engage one node at a distance of 46 cm from the first. The free ends trimmed. Fasteners cord must be secured to the frame and wrap the cord around the part to fix the curtains. Roman curtain is ready to use! Now that you know how to sew curtains with his hands. And it turns out that this is quite simple and exciting experience. In addition, with new curtains, you can decorate the room, give it a highlight and surprise guests handmade product.